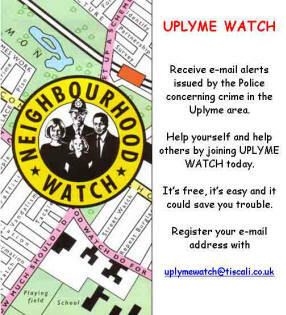 The Uplyme Neighbourhood Watch organisation attempts to both distribute police messages to residents and collate information from the local district. As one of the founder co-ordinators, I could see the benefits of the rapid exchange of messages concerning criminal and unwelcome behaviour throughout our community because, although we are fortunate to live in a relatively crime free area, nowhere, sadly, is immune from occasional trouble. Initially information was distributed by good old-fashioned leg work and telephone but subsequently the benefits of an email system became obvious. To this end I set up a system called UPLYME WATCH where interested residents could register their e-mail addresses at a central point and receive police messages about local issues as soon as possible. The system can also register and forward concerns and queries from any individual who has doubts about suspicious or unwelcome behaviour in our local area. These may not be serious enough for immediate police involvement, but putting them on record may just help the police in their subsequent investigations. The e-mail address is uplymewatch@tiscali.co.uk please register today. It doesn't cost anything and your e-mail address is held confidentially for Neighbourhood Watch purposes only. We can all do our bit not only to help ourselves and our neighbours, but also by supporting the police in their efforts to maintain Uplyme as a trouble free area. 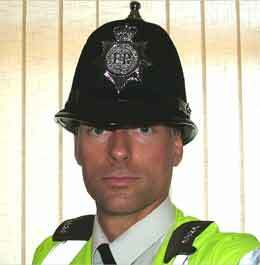 Uplyme's community police officer is PC 4924 Andy Carmichael (Officially your Neighbourhood Beat Manager), based at the Axminster police station. Andy is part of the Devon and Cornwall constabulary and can be contacted on 08452 777 444 at Axminster Police Station, or by email here. Identity theft can result in fraud affecting your personal financial circumstances, as well as costing government and financial services millions of pounds a year. If you become a victim of identity theft, it could be hard for you to obtain financial services in the future.